What have Dobby the House Elf, and a Robot Called Yolanda got to do with Shaping the Future of ITSM? I was hoping the title would prickle your interest, in this internet driven world in which organizations are competing for their market share of your clicks. If you have got this far then I have just captured one of yours. Clicks are becoming the currency in this new digital economy. Clicks driving the frenzy for digital transformation, Clicks causing industry wide disruption. So what is the answer to the title of this blog? I was honored to be invited as keynote at the itSMF Singapore‘ ITSM Leadership Forum’. The theme being ‘Future of Service Management with Digitalization and Disruption’. Disruption being the key theme. In my Harry Potter themed opening presentation I declared that most organizations will fail to realize their ‘Digital Transformation’ ambitions because of the number 1success or fail factor in IT – ‘ABC of ICT – The secret potion to Transformation’. ABC stands for Attitude, Behavior and Culture. Success in Service Management isn’t about the frameworks and best practices, nor about technology – it is about changing mindsets and behaviors. In my session I revealed ABC issues taken from 4000 organizations that reveal why we will fail! How to solve these issues? I suggested we needed to adopt more ‘Slytherin’ cultural values and behavior. (Syltherin being one of the 4 houses at Hogwarts School of Witchcraft and Wizardry in the world of Harry Potter). These values being ‘Ambitious; Strong Leadership; Achievement oriented’. But we do that already! Surely !? If we want a seat at the table then we need to improve IT’s Trust and Credibility and start demonstrating value. Dobby represents one form of the disruption in this new era of digital transformation, not just the business disruption caused by emerging technologies but disruption that is changing the role of IT, and IT Service Management. IT Service Management is now a strategic capability. No longer an operational ‘keeping the lights on’ capability, however as stated in a Forbes article in 2017 ‘Skills shortages are the greatest challenge in aligning IT to business services’. It isn’t just CIO’s as mentioned above. ALL in IT must start understanding and demonstrating Value. ‘What does that mean? Value! – another hyped word’(and the subject of this blog). What is a VOCR? – is it a magical spell? 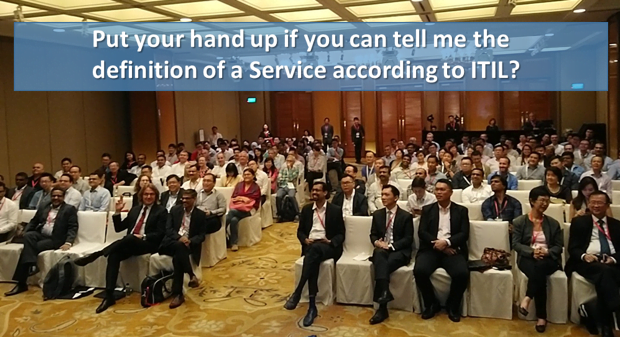 First we need to start with the following mindset shift – I asked people in my session – ‘Put your hands up if you can tell me the definition of a service according to ITIL’. My trusty assistant Akshay from Axelos took a picture. As you can see, hardly any hands were raised hands – apart from consultants and trainers. 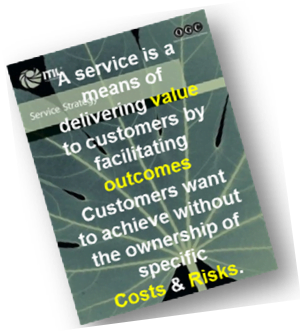 I revealed that a Service is all about ‘Value, Outcomes, Costs, Risks’ (VOCR) – preferably from a business perspective. 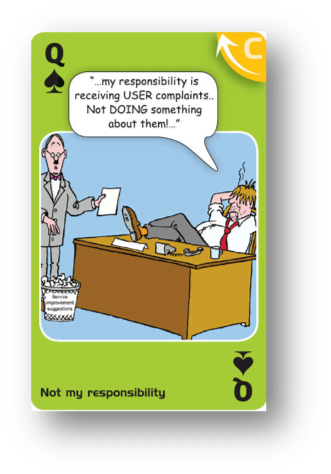 It isn’t a problem that people don’t know the definition, the problem is that this is a symptom of the fact that VOCR needs are rarely used to drive the ITSM practices! But we send people to ITIL training and implement ITIL processes without understandinghow these frameworks need to contribute to and demonstrate Value. All too often ITIL, or for that matter any other framework, becomes the ‘Goal itself’, rather than what value are we hoping to achieve, and what behavior change are we hoping to enable. As a result many IT Service Management improvement initiatives fail to achieve the hoped for value. I used Neville in Harry Potter as an example. He wants to help Harry but isn’t doing the right things, at one stage declaring ‘Oh my God, I’ve killed Harry Potter’! I made the analogy with ITSM – 70% of IT investments don’t deliver value and trillions lost in downtime – despite our best efforts in ‘deploying frameworks’ – so much for ‘achievement oriented’. It is not about the framework! It is about why you are using it? What value must it deliver?Is it any wonder we get treated like Dobby! I quoted Dumbledore “Dark times lie ahead of us and there will be a time when we must choose between what is easy and what is right“. We in IT adopt the easy route to become a ‘Service Provider’, what is right in this age of digital disruption is that we are ‘ambitious’ – setting our sights on becoming a ‘Trusted Advisor’ or ‘Strategic partner’ by developing a strategic BRM capability (Business Relationship Management). However I see Dark times ahead. Only 3 hands went up from the more than 200 when asked ‘How many of you have a BRM capability’? 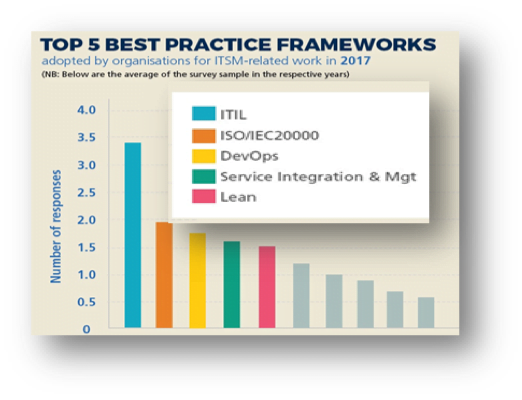 This was also confirmed in the results of the itSMF IT Service Management Global Survey showing the top best practice frameworks. There is no mention of BRM. Cobit or ISO38000 wasn’t there either as an IT Governance framework. Why should they be there? Back to Dumbledor’s quote. There are Dark Times ahead, the Dark forces of cyber criminality out to attack us, The Dark forces causing us to fail to realize the HOPED for goals of transformation initiatives putting businesses at risk. Learn a new language. Not Agile or DevOps – Parseltongue! Professor Alex Slow in his session ‘Should IT align with the business or business align with IT in the age of disruption’ revealed that many organizations struggle to understand or gain value from the new emerging technologies that are disrupting business models. He ascribed this to a number of things, one being ‘a failure of IT governance, if it did not incorporate emerging technologies into its role’. Going on to add that IT Governance is there not to ‘control’ but to ‘facilitate’, yet many people mistake Governance as ‘controls’. This is what Dumbledore describes as choosing between what is easy (IT Governance a compliance and control mechanism, driven by auditors) and what is right (IT Governance as an instrument to drive and sustain Value). This represents the need for a mindset and behavior shift on the business side too. The second reason he mentioned for failing – ‘Communication skills in IT’. We must be able to articulate the business value of emerging technology. In my session I again quoted Dumbledore “Words are, in my not-so-humble opinion, our most inexhaustible source of magic. Capable of both inflicting injury, and remedying it.” In Harry Potter, Harry can speak Parseltongue, ”…Apart from merely communicating with serpentine lifeforms, Parselmouths also seem able to influencethe will of serpents to a certain extent.” – Serpentine (Snake like and slippery) is how we in IT sometime describe the business!.. but speaking the right language will help influence their behavior. However the way we currently communicate in IT is injuring our relationship, our trust and credibility. I suggested people read scene 3 & scene 4 in this screenplay blog, and see if they recognize this in theirorganization. This is something we see almost every time we play the Grab@Pizza Business & IT-Alignment simulation with teams globally! I also suggested people read the ‘Phoenix Project’ book. Particularly chapter 25 and 26 if they want to see the types of conversations we should be having. In my presentation I also quoted Snape from Harry Potter “The Dark Arts are many, varied, ever-changing, and eternal”. (The Dark Arts being all the IT frameworks and best practices. I called them Dark Arts and said be wary of all the CONsultants trying to convince us to ‘implement or install the latest framework or tool’) – ‘Fighting them is like fighting a many-headed monster, which, each time a neck is severed, sprouts a head even fiercer and cleverer than before’. Revealing now VeriSM and ITIL4, more sprouting practices that, if used incorrectly become Dark Arts. I revealed that one of the reasons we fail is too much focus on the theoretical certificate rather than the practical application of the theory, more about that in this blog. Even Snape recognized the need for this ‘As part of their Transfiguration course, students must sit a written exam, and then complete a practical exam’! If only more IP or framework owners would add this as part of their programs. Suresh GP, presented VeriSM and also made the link with IT Governance and a focus on value, Suresh went on to reveal how he uses the ‘MarsLander simulation exercise to help translate theory into practice. Harold Petersenpresented DevOps and the need for addressing culture change, he also showed how he uses the ‘Phoenix project simulation’ to translate theory into practice and showed how the DASA competence model can be used to assess and improve team individual and team skills. A further example of this hereon the DASA (Devops Agile Skills Association) website. Amelia Ching in her session ‘Paradigm shifts in IT Service Management operations in the age of Agile, DevOps, Cloud – Are you ready’ talked about the 4thIndustrial revolution. ‘Speed & Agility being the new currency of business’. She talked about the ‘new norm – human and robots co-exist in or daily lives’. Thisis not something of the future it is happening now! As I stepped into my hotel lift a Robot called Yolanda wheeled its..her.. way in, turned and told me it (she, I don’t want to be accused of anti-diversity practices) would be stopping at the 10thfloor’! It may seem like a gimmick. 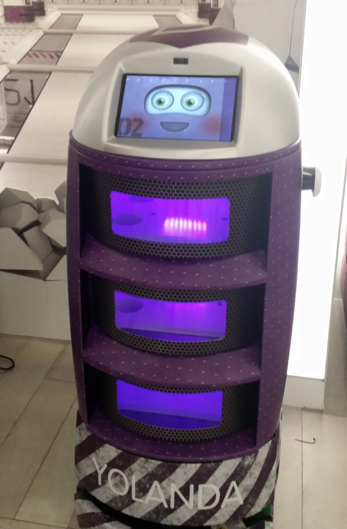 I looked it up on the internet ‘Robots are taking Singapore’s hotel Industry by storm’! – with labor shortage and technological disruption threatening the viability of the traditional model. One hotel claiming a Robot helps save 19.3 man-hours daily – equivalent to the work of 3.5 Full Time Employees (FTE’s). 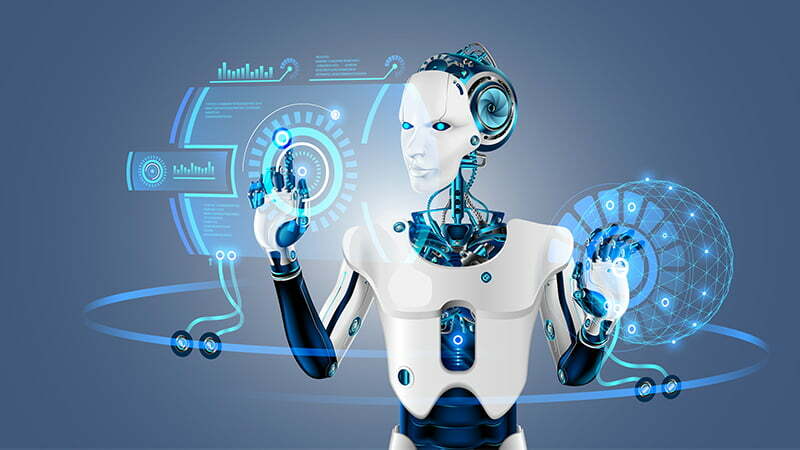 Not only does this raise the specter of Robots replacing Jobs, but for Service Management it is one more ‘User’ to call the Service Desk asking for IT support – ‘Help me, my programming is wired wrong. I keep banging my head against a wall’(I know how she feels I have been banging my head against a wall for 15 years – see why). Amelia asked ‘how many do not have a mobile phone’? – no hands went up. This is our own personal wallet that gives us access to the click economy. This 4thIndustrial revolution puts IT slap bang in the middle ‘data is the new oil’ a cliché that Amelia reminded us of. IoT, Robotics, AI. To quote Michael Ganzer ‘Digital transformation represents the beginning of the most significant transformation in our lifetimes’ – It is time for IT to recognize this and step up to the plate. More evidence why in this blog. Akshay Anand from Axelos presented the latest on the progress of the ITIL update. 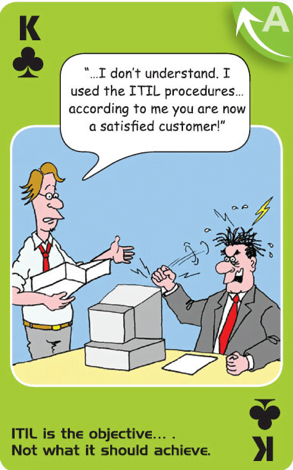 Revealing that it will be called ITIL4. The 4 representing the 4thIndustrial revolution. We can only assume it will address many of the issues and failings mentioned above under the label ‘Dark Arts’ – Perhaps ITIL will add ‘Dark Arts’ into the Glossary ‘trying to install or implement as framework as the goal and thinking that a theoretical certificate is the same as practical ability’! Many of the speakers, including the special guest Patrick Tay, assistant secretary general of the National Trade Union Congress, referred to the pace of change and the need to continually learn and improve. In my presentation I once again called upon Dumbledore “Happiness can be found, even in the darkest of times, if one only remembers to turn on the light.” Lumos being the Harry Potter spell ‘to light up dark places’. I referred to the need for CSI. Continual Service Improvement, showing an example of hanging up CSI boards in each corridor upon which everybody could record improvement needs and specify for each improvement how they think it contributes to VOCR. An example of what Dumbledore describes as ‘remembering to turn on the light’- making improvements visible. Happiness is achieved by including all in specifying improvements and having management commit time and resources. However our global surveys reveal that less than 20% have formal CSI and the itSMF surveyshowed CSI as the lowest scoring in maturity. As Mike Orzan author of Lean IT stated ‘Improving your work is just as important as doing your work’! I finished my presentation with 2 more Harry Potter quotes. “Working hard is important, but there is something that matters Even more BELIEVING in yourself”.We need to believe we can make the shift from ‘Service Provider’ to ‘Strategic Partner’, and “It is the CHOICESthat show what we truly are far more than our ABILITIES”.